Several years ago I attended an Allergy Expo, they had all sorts of foods that I had never heard of one of them was SUNBUTTER! I had to be convinced to try it because it smelled and looked like peanut butter which all my life has been the enemy. For those that are new to my blog let me start at the very beginning. I was born with severe asthma, with my asthma came food allergies. One of my allergies is nuts. Therefore I have never had peanut butter or the infamous PB&J. When I was introduced to SunButter the only place I could find it was in an expensive grocery store that I didn’t shop in regularly. Now it is in my neighborhood grocery store and they have all the different varieties just like the other nut butters. SunButter is made roasted sunflower seeds from here in the USA. It has 7 g of protein per serving and more vitamins and minerals than nut butter. Most importantly to me SunButter is free from the top 8 food allergens: peanuts, tree nuts, soy, milk, eggs, wheat, fish, and crustacean shellfish (all of which I am allergic to). SunButter is grown and made in the USA. The locally-grown, specially-roasted sunflower seeds are processed in a dedicated peanut free and tree nut free facility. The sunflower seeds are grown in a region of the country where peanuts are not grown, eliminating the risk of cross-contamination. SunButter is vegetarian, vegan, gluten-free, and certified kosher. 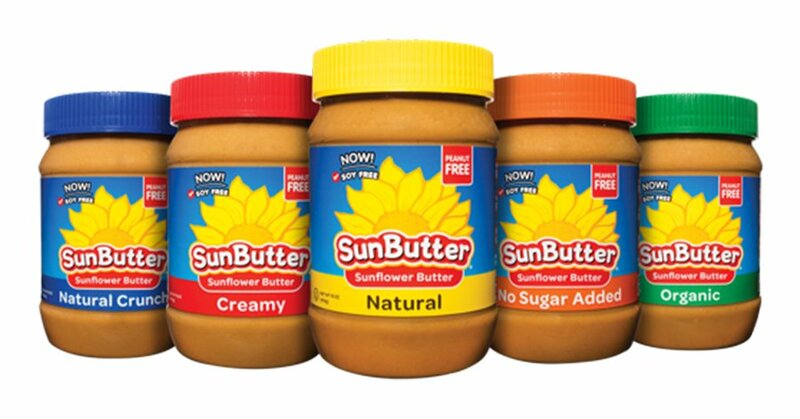 All SunButter varieties are made with non-GMO sunflowers, and most varieties are Non-GMO Project Verified. How do I eat SunButter? As many of you know I have been on a weight loss journey this last year so I was happy to find No Sugar Added SunButter. SunButter 5 different products: Natural, Creamy, Natural Crunch, No Sugar Added, and Organic. Part of my daily routine is to eat apple slices and I love eating them with SunButter. I try to eat protein and fiber with every meal and I have found this combination to be a winning combination for my weight loss. 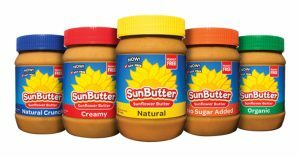 SunButter can be used in place of peanut butter in any recipe. I’ve tried it in my smoothies and look forward to trying it in cookies when I am able to eat them again. I will be posting recipes as I try them for my fellow nut allergy peeps. Please comment below any questions about this amazing product! Go to the SunButter website for a coupon and then head to your local grocery store and BUY SOME!! Let me know how you use it and if you like it.